This entry was posted on Monday, May 28th, 2012 at 8:41 am	and is filed under Celiac & Gluten Intolerance, Nutrition Therapy. You can follow any responses to this entry through the RSS 2.0 feed. You can leave a response, or trackback from your own site. I would love to win this! I have recently discovered the substantial link between what I eat and my abnormal, debilitating anxiety and would love to learn more. Trudy is amazing and I love that you featured her and her book. I have a close relative who struggles with anxiety so much that she sometimes has to pull her car over on her way to/from work because of the traffic. She would greatly benefit from receiving Trudy’s book (which I will promptly send her if I win it!). Wonderful giveaway! I didn’t know the foods you eat could effect your anxiety. This is definitely a book I need to add to my collection. This book looks fantastic Melissa. I’d love to win it. Food, the way we nourish our bodies affects every organ from skin to heart, to bones and everything in between…only makes sense the brain would be included in that, and I do personally notice a huge difference in brain/emotion/hormone function according to what I eat. Can’t wait to read more. 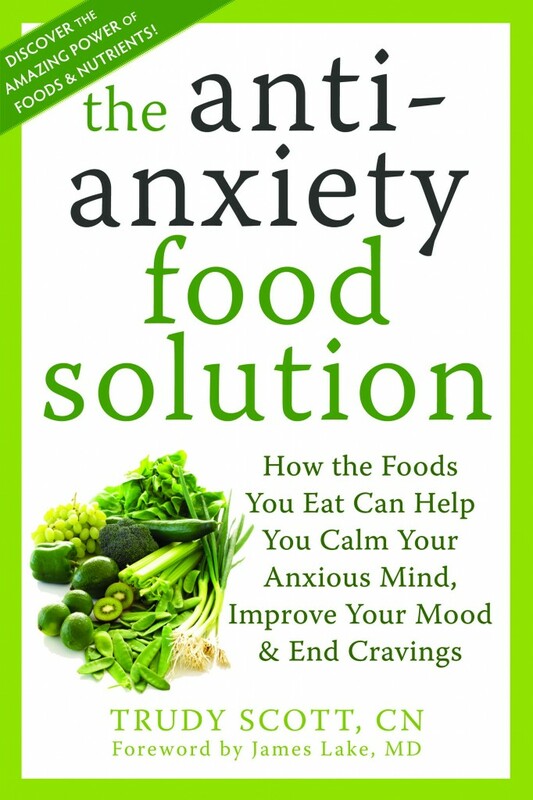 My anxiety has been getting better since I have been eating more raw fruits and vegetables and getting away from so many refined sugars and processed foods. Has anyone had good results with herbal supplements easing the anxiety? I know there is a ton of stuff available, but I would like some firsthand experiences. Anyone? Trudy’s work is really important in looking at the most obvious yet hidden way we sabotage our health. In her book – and her coaching work – she uncovers (and explains) how foods affect our mood (mental health) and our physical health as well. Lucky is the winner of the May giveaway!! Want more? Contact Trudy – she helped me understand and avoid foods that made me feel worse as well as find foods and supplements my body craves to live powerfully. As someone who is working at anorexia recovery, I still struggle with healthy ways to manage my anxiety. I feel like the knowledge Trudy has to offer in this book would be, for me, twofold. Me..Pick Me..Pick Me!! Or I’ll still have ANXIETY! Thanks..I really have been on the lookout for nutrtional help..yay for Trudy!! I would love to win this. I’m 18 years old and I have been struggling with severe anxiety and depression since I was 8. I’ve been poked and examined by many doctors. I’ve even been in the mental facility in my town due to my anxiety. I think this would help a lot. I need a new way to cope with my anxiety. And I’m tired of all the pills. I’d absolutely be interested in reading this! I’ve always dealt with some anxiety but it’s been getting worse in the past year or so. It would be great to address it with a natural approach. I am a 43 year old female who has lived with anxiety since my teenage years. I have been placed on many medications over the years and currently take Zoloft. However, of late I have been plagued with increased anxiety that has affected my sleeping patterns causing me to wake frequently throughout the night. It has taken a toll on all aspects of my life. I work full time and am a Mother of a wonderful 4 year old son. I would love a solution for the constant anxiety so that my son does not grow up with a Mom that is always anxious and worried!